SAN DIEGO (AP) Rory McIlroy had a week to remember his first trip to San Diego. He carried Northern Ireland's flag during the opening ceremony of the Junior World Championship and later had a picture taken at Torrey Pines with a certain Mr. Woods. And it was Earl Woods, the father of Tiger. "Tiger was probably off winning majors," McIlroy said with a laugh on the eve of his debut in the Farmers Insurance Open. McIlroy saw enough of the South Course - 10 holes on Monday, the pro-am Wednesday - to appreciate why this public course along the Pacific bluffs has been known for years as Woods' personal playground. Along with a Junior World title as a teenager, Woods has won the PGA Tour event seven times, and his most famous title at Torrey was that 2008 U.S. Open for his 14th major. "You need to be a tremendous ball striker. You need to be a great iron player, a great short game," McIlroy said. "And those have been the hallmarks of his game over the past 20-odd years. So I can see why he has done so well around here." Woods gets his next crack when he makes his 2019 debut at Torrey Pines, with a chance to win consecutive PGA Tour starts for the first time in six years. Never mind that his last start was four months ago at the season-ending Tour Championship. All that did was ratchet up the expectations, a far cry from a year ago when expectations were replaced by curiosity. Woods started last season after recovering from a fourth back surgery, unsure how he would respond from gouging out of thick rough or how much he would be able to play in the early part of the year. "Way different," Woods said. "Last year was very fluid, and it was like trying to hit a moving target. It was quite interesting to try and figure it all out as the year progressed. This year I have a great understanding of what I can and can't do. There's not uncertainly that I had last year after what I did at the end of last year." Woods brings a big buzz to a tournament that already has a lot going for it - good weather, gorgeous views of the Pacific, the first network coverage of the year (CBS) and the open week before the Super Bowl. Phil Mickelson is skipping his hometown event for the first time in 28 years, though there is no shortage of star power with Woods and McIlroy, Jordan Spieth playing for the first time in four years, Xander Schauffele, Masters champion Patrick Reed and Justin Rose, who remains No. 1 in the world. This is the first strong test of the year with a North course that has been upgraded and a South course renowned for hosting the U.S. Open in 2008, with another one coming in 2021. McIlroy had only seen the South course on television. He was only 10 when he played the Junior World, not old enough to compete at Torrey. Instead, he played at Presidio Hills in downtown, where he made a hole-in-one and tied for eighth with a group that included Tony Finau. But it has felt familiar to him this week. "I feel like I've watched this tournament a lot on TV, whether it be U.S. Open or this tournament over the years," McIlroy said. "It's funny, you get a sort of perception of a golf course from TV, but then you play it and it does play very differently than I thought it was going to play." Spieth hasn't been back since the North course was redone and the nines were flipped, so he couldn't figure out which hole he was on at times during the pro-am. But he remembers where he made his pro debut in 2013 (he missed the cut) and the following year when he played with Woods for the first time. 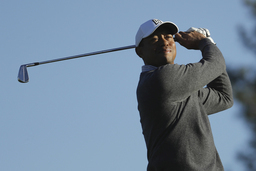 At Torrey, everything comes back to Tiger. Woods and Spieth practiced together Tuesday and at one point, Spieth asked him how long he had been coming to the tournament. "Ten years longer than you've been alive," he replied to the 25-year-old Spieth. It was first tournament he attended with his father. It's a course on which he has won eight times as a pro, equal to his number of wins at Bay Hill and Firestone. And it's a tournament where a tie for 23rd last year felt like an accomplishment because he wasn't sure what to expect. "The fact that I was able to get through, I didn't have any zinging down my leg like I did before, I didn't have any problems at night recovering for the next day," he said. "Those are big accomplishments. This year, it's totally different. I know what I can do, so now it's about finishing a little bit better and winning some events."